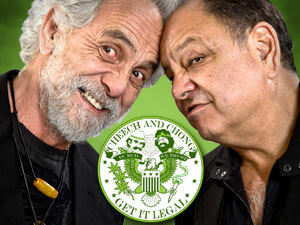 The dopemaster, Tommy Chong, turned 74 today. Tommy was born May 24th, 1938 in Edmonton, Alberta, Canada. CBS has decided to put the sitcom Rob! and the people watching it out of their misery. We are huge Rob Schneider fans, but this show was corny and unwatchable. Cheech Marin reprised his role as a stereotypical Mexican with horrible jokes. It was offensive. Additional info: ¡Rob! averaged a 3.3 rating in the demo with 11.02 million. This would have been good enough on any other network, but CBS's other shows have much higher ratings. Cheech and Chong fans have been asking when we'd be getting more shirt sizes in stock. That day has come. We also have more sizes for the discontinued and hard-to-find Up in Smoke Club shirt. And remember all shirts are $15 and shipping is free within the US and Canada. Someone posted a really cool 1974 interview with Cheech and Chong from the ABC archives. One of the first times Cheech revealed his dad is a cop. Last night, Saturday Night Live did a sketch about what Cheech and Chong movies would be like with an additional character. This weekend has been a very sad one as we mourn the loss of the Beastie Boys' MCA (Adam Yauch). Adam was a fantastic director, humanitarian, activist, musician and all around great guy. The rap and music world in general would be a completely different place if it hadn't been for the Beastie Boys innovations. Paul's Boutique is my favorite album. Critics panned it at first, I think, because it was ahead of it's time. However, every one of their albums are awesome. On Friday, I went to the Red Hot Chili Peppers concert at Prudential in Newark, NJ. RHCP kept mentioning MCA and playing snidbits of songs throughout the night. After playing What'cha Want, Chad looked to heaven and said thank you Adam. The Beastie Boys and RHCP both launched around the same time and were inducted into the Rock and Roll Hall of Fame a couple weeks ago...the same night as the Beastie Boys. The last thing Adam Yauch worked on was Fight for Your Right Revisited which was essentially the video for Make Some Noise off of Hot Sauce Committee Part Two (great album, pick it up). It features lots of actors including Will Farrell and Steve Buscemi. Adam was a big Cheech and Chong fan. "We're the Beastie Boys, not Cheech and Chong." Here are some clips from the Red Hot Chili Peppers show. Cheech Marin will be spending this summer with the rest of the millionaires in the Hamptons. Cheech will be spending $35,000 per day renting The Sandcastle (don't tell his ex-wives). The Sandcastle has some great amenities, like a movie theater, bowling alley, walk-in refrigerator, wine room, climbing wall, basketball court, private gym and spa and lots more. Natasha Marin, Cheech's third wife, has family in New York so that's another reason they are renting a place on the east coast. Humanity needs your help. We all need to team up and protest the internet censorship act, Cyber Intelligence Sharing and Protection Act (CISPA). The act allows your internet activity to be monitored. It also allows the government to require you have an internet id. You will need this id to access the internet, including your email. All privacy will be gone. We can only pray that Obama keeps his word this time and vetoes CISPA! But the protests will continue with or without him! Anonymous and its like-minded supporters are planning coordinated protests against: AT&T corporate offices May 1 through May 5 IBM headquarters May 4 through May 7 Intel headquarters May 8 through 13 Microsoft offices May 14 through May 19 Verizon Wireless offices May 20 through May 26 Bank of America headquarters May 27 through June 2 Chase Bank headquarters June 3 through June 6 Target stores June 15 through June 20 Walmart stores June 21 through June 25 CVS stores June 26 through June 28 Mastercard, Visa, and American Express June 28 through June 30. The group also plans a selective textbook vandalization effort against McGraw-Hill June 7 through June 10. Pepsi and Coca-Cola product boycott June 11 through June 14. Protesters are advised by the video to remember their Guy Fawkes mask at all events.